Additionally, we’re looking at having the classes gradually layer in more capabilities over the first two or three levels, rather than providing a large number of class features at level 1, so that players new to the class have a short period of time to learn the basics of their class through play. Experienced players could simply start at 3rd level if they want to leap right into a more advanced starting experience. I think this is an excellent approach, and one that I have been advocating for some time. 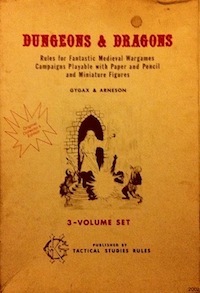 I have observed before that in terms of both power and complexity a first level Fourth Edition character is approximately equivalent to a 4th – 6th level traditional D&D character. So why not let every group start at the place that they want to? The important principle here is to expose complexity slowly through play rather than all at once at the beginning. That also makes the game more social, as other players will experience your character’s progression. The magic-user, for example, is a very complicated class, even if you restrict available spells to the core rules of whatever edition you are playing. The only reason that this complexity is tractable (and why the class remains playable by people not interested in system mastery) is because the spells are introduced gradually during level progression (see also this post by Jeffro for the apotheosis of this insight). I would also like to see more advancement options tied to events within the game world. Thus, a fighter who wants to learn a special whirlwind attack ability might need to seek out a master to learn from, or discover an ancient manual of techniques. Then, they could use their next advancement point (or whatever) to learn that ability (maybe in place of a base attack bonus increase). This increases the uniqueness of individual characters and combats bonus inflation while not adding any complexity. Positive effects all around. The framing here is critical though. It’s important that players not see the first three levels as training wheels that experienced player should want to bypass. Rather than capabilities layered in over levels 1 through 3, I think capabilities should be layered in slowly over the entire level range. I also think there is an inverse relationship between potential setting deadliness and work required to build a new character. If you want save or die with teeth you can’t have character generation as complex as 3E or 4E. Players simply won’t stand for their special snowflake PC (which took an hour or more to build) being killed in the first ten minutes of play because they did something stupid. To be honest, I really can’t see any other way that you can get both players who are interested in quick character creation and players who are interested in complex character builds to play the same game. This entry was posted in Uncategorized and tagged D&D 5E on March 25, 2012 by Necropraxis. Yeah, I’ve gotten lots of ideas from NGR. I have a copy of the lion printing actually. I have pondered this issue as well. When a new player joined my 4E D&D campaign, I knew that she was not going to be “into” the rules and tweaking out her character build. In the older editions, there was a tendency in my gaming circles to push new players to play the simpler classes like a fighter. Now that I am older (and hopefully wiser) I did not want to push her into any direction but she chose to be a warrior of her own accord. But there is not much difference between the PHB fighter and wizard in 4E. Unless!!! You consider how the game mechanics work for the Essentials line. Which made me go back and dig out the Essentials book and generate a slayer (with simple swing and attack game mechanics). I feel as though WotC are really just going for a “do over” of what they were trying to achieve with the Essentials line.